This article first appeared in The Edge Malaysia Weekly, on April 2, 2018 - April 08, 2018. 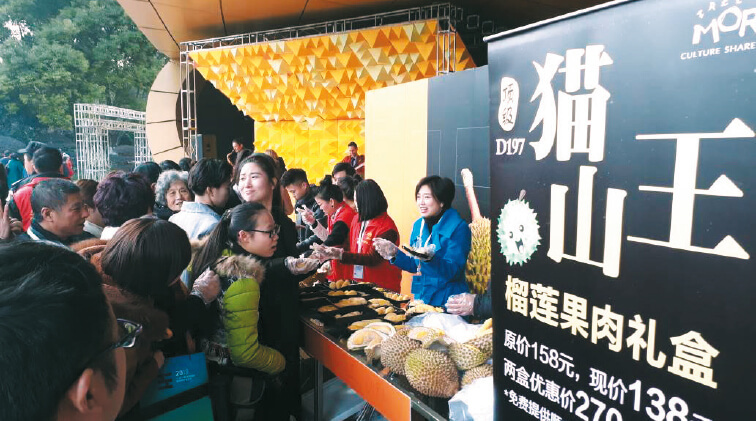 Locals enjoying the king of fruits at the Investment and International Trade Forum 2018 in Hangzhou, China. OIL palm is still the most efficient oil crop in the world in terms of yield per hectare. Yet, as smallholders contemplate the overdue replanting of old trees, some oil palm estates may well become Musang King durian plantations because this particular species of durian is commanding astronomical prices in China. If oil palm — which replaced rubber trees as the dominant crop in Malaysia — helped alleviate poverty among many smallholders, the Musang King holds the promise of new wealth, if prices hold up. For farmers, one hectare of Musang King trees can yield RM155,250 a year — nearly nine times the RM17,500 harvest from a hectare of oil palm, Minister of Agriculture and Agro-based Industry Datuk Seri Ahmad Shabery Cheek told reporters on March 11 after planting one of 600 Musang King trees on a 6ha pioneer plot at the Federal Land Development Authority (FELDA) Neram 1 settlement in Kemaman, Terengganu. 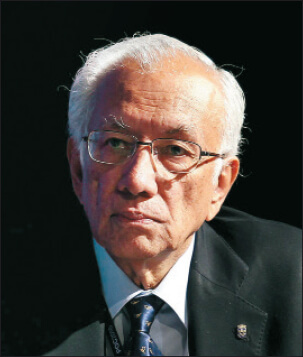 FELDA Kerteh 6, FELDA Neram 2, FELDA Cerul 1 & 2 and FELDA Seberang Tayor will also have durian projects, the Kemaman member of parliament was reported to have said. While critics dismiss the move as one that “takes care of the FELDA vote bank”, other industry observers acknowledge the burgeoning market for Musang King, the “king of the king of fruits”. “Many small growers are now talking about it. In fact, a large plantation in north Johor is planning to plant 10ha of durian of different species. Well, everyone is betting on continuous demand from China. But is it economically sustainable if supply increases?” oil palm industry veteran M R Chandran tells The Edge. “The major risk factors I anticipate here is that if everyone jumps on the bandwagon and switches to durians on a large scale, is there sufficient availability of high-yielding hybrid varieties?” he asks, relating how when oil palm cultivation expanded rapidly in the 1970s and 1980s in Malaysia, many oil palm smallholders only found out 36 months later that the planting material they had sourced were contaminated and were not the high-yielding hybrid they thought they had purchased. “If farmers are embarking on planting durians on a big scale, they will need government assistance, from the supply of proven good-quality planting materials to marketing of produce. This would mean some sort of regulations will need to be put in place to ensure the economic sustainability of the king of fruits,” adds Chandran, who chaired the panel session on “challenges and opportunities” at the recent 2018 Palm & Lauric Oils Conference. The RM155,250 annual income from one hectare of Musang King cited by Shabery Cheek is based on the price of RM25 per kg. Prices of top-quality durian could exceed RM100 per kg, which bodes well for Malaysia’s target of exporting RM92 million worth of the fruit to China by 2020. It supplied RM23 million worth of durian last year. China imported 612,063 tonnes or US$1.1 billion worth of fresh durian in 2016, according to the United Nations’ commodity trade statistics. Prices have also increased faster than volume. The value of China’s fresh durian imports grew an average 26.2% a year in the past decade, double the 12.8% 10-year compound annual growth rate (CAGR) that import volumes grew at between 2006 and 2016. It is little wonder when durian is also being used to flavour cookies, coffee and even crepes and pizza in the republic. That is on top of the usual cream puffs, tarts and ice cream. Enterprising orchard owners here are benefiting from tourists who salivate over the creamy flesh of the fruit. However, Thailand is still by far the world’s leading exporter of durian. Some US$1.094 billion, or 99.59%, of China’s US$1.1 billion fresh durian purchase in 2016 were from Thailand. In terms of volume, Thailand supplied 99.89% or 611,380 tonnes of durian to China that year. Malaysia’s market share is very small but its durian sells for more money. As it can only sell frozen or processed durian directly to China — fresh fruits have to go through Hong Kong or Thailand, unless special permission is granted — the country sold 542 tonnes for US$4.34 million or about US$8 per kg in 2016. The 611,380 tonnes that Thailand sold to China for US$1.094 billion means that the Chinese paid US$1.79 per kg, back-of-the-envelope calculations show. Unlike oil palm trees — which produces a uniform product, although yields can increase with better management, better soil conditions and favourable weather conditions — durian trees are deemed as “temperamental”. “Even a 50m difference on the same plot of land can produce different quality durian,” a seasoned oil palm planter says. Another local planter concurs. “Yields can be inconsistent, even within the same durian orchard. It’s not just the quality, but the taste, even if you plant the same hybrid,” he says, pointing out why durian from places such as Raub, Bentong, Batu Kurau or Penang island taste better. “Indonesia also has durian. Medan has good soil too, but I am told the taste of the durian in Indonesia is different … I prefer Malaysian durian, hopefully, the [mainland] Chinese do too, but that is personal preference,” he adds. Chandran sees durian as more of a crop for smallholders, many of whom have done well growing and exporting all kinds of fruits, vegetables and cut flowers on top of the king of fruits. He has a word of caution for those looking to profit from the durian boom: “Freezing technology [to make the fruit last longer] has been around for a while, so it is not impossible to make an industry out of durian … but there is no guarantee prices will stay where they are when more supply comes in … Thailand is a big grower [of durian], and there is also no stopping China, Vietnam, Myanmar or even Indonesia from growing durians too.” He points to the success of Vietnam in growing coffee beans. More competition could come with the advances made in irrigation technology and biotechnology, which will help certain countries become more successful in the industrial farming of non-native fruits. “Who would have thought that Australia would be a major producer of tropical fruits like mango, bananas and papaya [and] a dry land like Israel could produce beautiful crops?” says Chandran, noting that Australia is already producing durian. Last year, a team of durian-loving scientists from Singapore sequenced the Musang King genome. In researching the durian’s strong distinctive smell, they traced the fruit’s lineage back 65 million years to a common ancestor with the cocoa plant. This might well pave the way for the creation of new durian species that are drought-resistant or have lower-sugar content. “This [durian price boom] is an opportunity, even for some plantation companies, but we [Malaysia] must get it right … We must make sure we can maintain leadership, which we have lost in cocoa, rubber and oil palm,” says Chandran.